Come join Bisbee Rotary Club for Vintage Bisbee 2016 on October 8, 2016 from 4 pm to 7 pm. This year, enjoy wine and food pairings, a Fine Art Show, craft beer, non-alcoholic beer and wine, soft jazz by Out of the Blue, and a reduced ticket price. The cuisine is provided by a variety of Bisbee chefs and restaurants. All tickets purchased online from now on will be at "Will Call" at the gate the night of the event. Sponsorships are available. Please contact the event chair, Patricia Worth at 520-432-0725 or naturally.living@yahoo.com. We thank you in advance for your support! 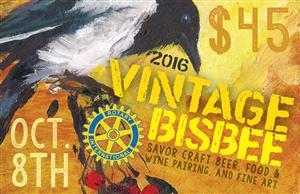 Vintage Bisbee is the primary annual fundraiser for Bisbee Rotary Club. Proceeds support the community work of the club including Christmas in Naco, dictionary and thesauri for students in Bisbee and Naco, Arizona, three lifelines for local senior citizens, and support for other local non-profit agencies including The Boys and Girls Club and The Coaster Races.